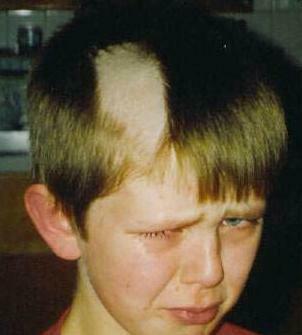 Most people do not cut their own hair (of course some do… see photo) they go to a professional! What I find interesting is that a person will go out and try to sell their own home without the use of a professional. This is a tough market and you need all the help you can get. Why? because I am to close to the product (my home). I have done improvements, that I think are of great value that the buyers (in this market) will not even see as a feature….Can you relate? We can all use input from others and when you are talking about selling your largest asset, it just makes sense to talk to a professional…. Stop cutting your own hair! Call a REALTOR today! You will save time and money! No that is not a picture of me! lol!! !